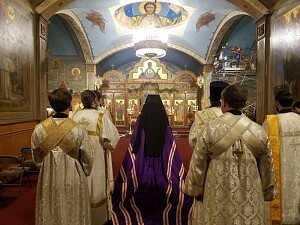 On Monday the 14th and Tuesday the 15th of January, Holy Dormition Convent "Novo-Diveevo" in Nanuet, NY celebrated the patronal feast of the convent’s principal church – St. Seraphim Cathedral. 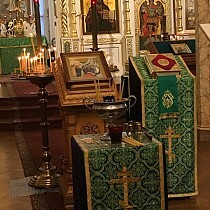 All-Night Vigil was served on the eve of the feast, while the traditional services were performed the day of: a moleben and akathist to Venerable Seraphim, Wonderworker of Sarov, the Great Blessing of the Water, and Divine Liturgy. On the morning of January 15, the clergy and faithful greeted Eastern American Diocesan vicar Bishop Nicholas of Manhattan. Concelebrating with Bishop Nicholas at Liturgy was cathedral dean Archpriest Alexander Fedorowski, Archpriest Mark Burachek (rector of Our Lady of Kazan Church in Newark, NJ), Archpriest George Kallaur (MP cleric), Abbot Photius (Oulanov; convent cleric), Archpriest George Zelenin (rector of St. Michael Church in Wayne, NJ), Priest Nicholas Belcher (cleric of the Antiochian Archdiocese of North America), Protodeacon Serge Arlievsky & Deacon Nicholas Ilyin (convent clerics), and Deacon Alexey Pnev (cleric of Nativity of the Mother of God Church at the New Kursk Root Hermitage in Mahopac, NY). Upon conclusion of Liturgy, Bishop Nicholas expounded on the significance of St. Seraphim in our everyday lives and the two feasts celebrating his memory during the course of the year. 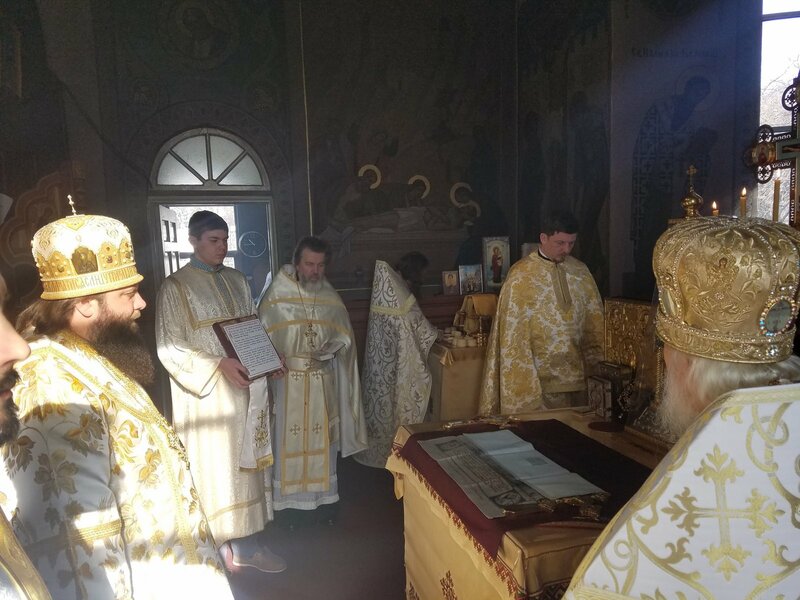 His Grace drew upon the relationship between the Mother of God and the venerable saint, reminding the faithful how the elder of Sarov cherished the Kursk Root Icon and how we must do the same, with her in our presence. Bishop Nicholas thanked the clergy, choir, and faithful for their prayers and congratulated the convent sisterhood on the cathedral’s patronal feast day. His Grace also greeted Fr. 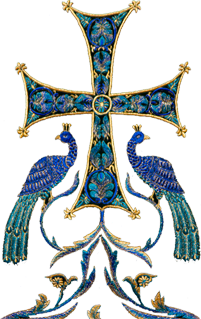 Nicholas Belcher from the Antiochian Archdiocese, relaying the prayers of the Russian Church for the persecuted Orthodox Christians in the Middle East. A luncheon was prepared in the convent hall, where interaction among the faithful continued throughout the day.